After the end of his college career, Lillard participated in a professional all-star game on November 26, 1931; he helped his team to a win with a 55-yard touchdown run. In a second All-Star game, he recorded a 45-yard touchdown run for a Chicago-based team in a 20–6 win. These performances attracted the attention of NFL teams. For the 1932 NFL season, he joined the Chicago Cardinals. In his first NFL game, against the Portsmouth Spartans, Lillard converted an extra point attempt that helped secure a 7–7 tie. One week later, the Cardinals tied the eventual NFL champion Chicago Bears; Lillard's performance was praised in the Chicago Defender, which called him "the whole show". After wins against the Boston Braves and Providence Steamrollers (in a non-NFL contest), the number of plays in which Lillard was on the field for the Cardinals sharply declined. During the latter part of the 1932 season, "Lillard's teammates had stopped blocking for him", according to Coyle. Toward the end of the season, he was benched by the Cardinals; it is unknown whether this was because of an injury or a suspension. Jack Chevigny, the Cardinals' coach, indicated that Lillard had occasionally failed to attend practice, and had arrived late at other times. The lack of playing time for Lillard was attributed to internal disputes caused by "lackluster effort and a prideful attitude"; the Chicago Defender offered a different explanation, accusing Chevigny of racism towards Lillard. He ended the season with 121 rushing yards in 52 attempts, and nine successful passes in 28 attempts. Lillard was a backup in 1933, although he was one of the Cardinals' leading players when he received playing time. In the first game of the 1933 NFL season, against the Pittsburgh Pirates, he missed an extra point attempt that proved to be the margin separating the teams in a 14–13 Pirates' win. Lillard was subsequently ejected from the game, having been involved in a dispute with Pirates player Tony Holm. One week later, he threw a touchdown pass in a 7–6 loss to the Spartans, though he received criticism from local newspapers for a missed extra point attempt and a short punt that led to a Portsmouth score. In the Cardinals' third game of the season, against the Cincinnati Reds, Lillard kicked a fourth-quarter field goal to secure Chicago's lone win of the 1933 season. 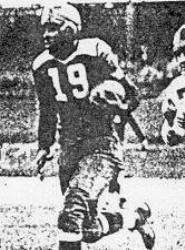 After the kick, Lillard was punched by Cincinnati guard Les Caywood; he responded with a punch to Caywood's head, and was thrown out of the game along with Caywood. He played a key role in the Cardinals' October 15, 1933 game against the Bears. In addition to converting a field goal attempt, he had 110 yards in punt returns, including a return of more than 50 yards in which he outran Bears star Red Grange for a touchdown. However, the Cardinals lost by a score of 12–9. In 1933, the Cardinals posted 52 points in 11 games; Lillard scored 19 himself and had two touchdown passes. He had 373 rushing yards from 119 attempts. The Chicago Defender called him "easily the best halfback in football". During his time in the NFL, Lillard was regarded as a player with multiple talents, possessing the ability to complete passes and execute running and kicking plays. Author Charles Ross called him "a superior athlete" due to his skills in baseball and basketball, and added that in the NFL "arguably he was one of the best players in the league." He was frequently baited into fighting by opposing white players. His responses during these incidents went against cultural expectations for African-American athletes; Sports Illustrated's Daniel Coyle wrote that they "were regarded by all whites and many blacks as prideful foolishness, if not sheer lunacy." It is not known how other Cardinals players viewed Lillard. Cardinals coach Paul J. Schissler said that he was forced to remove Lillard from some games due to injuries suffered when teams "gave Joe the works". Lillard also received racial abuse from fans; author Alan Howard Levy wrote that spectators in Portsmouth, Ohio regularly taunted him when the Cardinals played there. After the 1933 season, Lillard was not retained by the Cardinals, and he did not play again in the NFL. The Cardinals' decision was criticized as racially motivated by African-American publications. Schissler acknowledged the existence of an unofficial regulation against African-American players in the NFL, and stated that the team's move was aimed at protecting them and Lillard from violence. In his two-year NFL career, he had 171 rushing attempts, in which he gained 494 yards. The media gave him the nickname of "The Midnight Express". In the late 1930s, Lillard began writing a column on sports in the Independent News. Later in his life, he moved to Astoria, Queens, working at an appliance store and for Vinn Sporting Goods. Lillard had a stroke on September 18, 1978, and was afflicted with agnosia as a result; he died in New York City's Bellevue Hospital Center. 1 2 Craft, Roy (November 16, 1931). "The Life Story of Joe Lillard". The Register-Guard. p. 6. Retrieved June 9, 2010. 1 2 3 Buehner, Kristin (February 24, 2004). "'He Did It All'". Globe Gazette. Retrieved December 24, 2011. 1 2 Levy, pp. 38–39. 1 2 "Joe Lillard, Star Oregon Back, Is "Benched", Then Reinstated". The Spokesman-Review. October 9, 1931. p. 17. Retrieved September 11, 2012. ↑ "Oregon To Lose Back Saturday". Ellensburg Daily Record. Associated Press. October 8, 1931. p. 1. Retrieved October 8, 2012. 1 2 3 4 5 6 7 8 9 Chalk, Ocania (June 19, 1986). "Lillard remembered: 'Midnight Express' the best gridder?". The Rock Hill Herald. p. 8A. 1 2 Levy, p. 46. 1 2 3 4 5 Smith, Thomas G. (1988). "Outside the Pale: The Exclusion of Blacks from the National Football League, 1934–1946" (PDF). Journal of Sport History. 15 (3). Retrieved September 9, 2012. 1 2 3 "Joe Lillard". Pro Football Reference.com. Retrieved June 10, 2010. ↑ "1933 Chicago Cardinals". Pro Football Reference.com. Retrieved June 10, 2010. 1 2 3 4 5 6 7 8 Coyle, Daniel (December 15, 2003). "Invisible Men". Sports Illustrated. 441 (7091): 124–136. Bibcode:2006Natur.441..382M. doi:10.1038/441382a. Retrieved September 13, 2012. 1 2 3 Gill, Bob; Maher, Tod (1989). "Not Only the Ball Was Brown: Black Players In Minor League Football, 1933–46" (PDF). Coffin Corner. 11 (5). Retrieved August 14, 2016. ↑ "Joe Lillard". Baseball-Reference.com. Retrieved August 14, 2016. 1 2 MacCambridge, pp. 17–20. Carroll, John M. (1998). Fritz Pollard: Pioneer in Racial Advancement. Chicago: University of Illinois Press. ISBN 0-252-06799-1. Levy, Ryan Howard (2003). Tackling Jim Crow: Racial Segregation in Professional Football. Jefferson, North Carolina: McFarland & Company. ISBN 0-7864-1597-5. MacCambridge, Michael (2004). America's Game: The Epic Story of How Pro Football Captured a Nation. New York City: Random House. ISBN 0-375-50454-0. McKenna, Brian (2007). Early Exits: The Premature Endings of Baseball Careers. Lanham, Maryland: Scarecrow Press. ISBN 0810858584. Ross, Charles (2001). Outside the Lines: African Americans and the Integration of the National Football League. New York City: New York University Press. ISBN 0814774962.